At Kenny’s Wood Fired Grill in Dallas, chef Kenny Bowers beefs up a classic all-American potato salad with cheddar cheese, bacon and ancho chili powder, adapting the flavor profile of a loaded baked potato. The combo of ingredients and spice make it the ideal side dish alongside a hot dog or burger this Fourth of July. 1. In mixing bowl, prepare dressing by combining mayonnaise, sour cream, creme fraiche, lemon juice, basil, mustard, ancho powder, paprika, salt and pepper. 2. 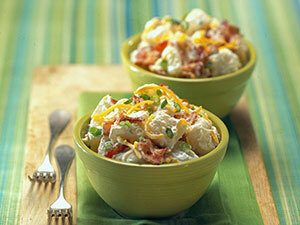 Fold in potatoes, potato skins, bacon, scallions, chives and cheddar cheese. Adjust seasonings to taste. 3. To serve, spoon potato salad mixture into serving platter or dish.